Location of South Beloit in Winnebago County, Illinois. South Beloit is located at 42°29′03″N 89°02′19″W﻿ / ﻿42.484228°N 89.038586°W﻿ / 42.484228; -89.038586 (42.484228, -89.038586). According to the 2010 census, South Beloit has a total area of 6.13 square miles (15.88 km2), of which 5.9 square miles (15.28 km2) (or 96.25%) is land and 0.23 square miles (0.60 km2) (or 3.75%) is water. As of the census of 2000, there were 8,051 people, 3,400 households, and 1,678 families residing in the city. The population density was 1,362.9 people per square mile (526.2/km2). There were 2,345 housing units at an average density of 592.2 per square mile (228.6/km2). The racial makeup of the city was 87.16% White, 5% African American, 0.63% Native American, 1.01% Asian, 0.07% Pacific Islander, 3.48% from other races, and 1.83% from two or more races. Hispanic or Latino of any race were 7.49% of the population. There were 2,165 households out of which 33.8% had children under the age of 18 living with them, 49.1% were married couples living together, 11.4% had a female householder with no husband present, and 34.5% were non-families. 28.8% of all households were made up of individuals and 10.3% had someone living alone who was 65 years of age or older. The average household size was 2.46 and the average family size was 3.01. In the city, the population was spread out with 26.5% under the age of 18, 8.7% from 18 to 24, 33.4% from 25 to 44, 18.5% from 45 to 64, and 12.9% who were 65 years of age or older. The median age was 33 years. For every 100 females, there were 98.1 males. For every 100 females age 18 and over, there were 96.2 males. The median income for a household in the city was $35,597, and the median income for a family was $41,154. Males had a median income of $33,110 versus $22,596 for females. The per capita income for the city was $18,363. About 8.2% of families and 10.0% of the population were below the poverty line, including 15.4% of those under age 18 and 7.6% of those age 65 or over. All historical knowledge is from the book, Our Golden History-South Beloit Illinois, which is a non-copyrighted work by Cathryn Hayes. She wrote the book to inform the people South Beloit of their roots. What is now South Beloit was previously full of natural resources such as copper, lead, and bog iron. Buff and blue limestones were plentiful everywhere in Winnebago County, with limestone forming the banks of the Rock River and Turtle Creek. The buff limestone gave the first settlers material for their houses and public buildings, some of which can still be seen in Rockford, Rockton, and Beloit/South Beloit. The older homes in South Beloit had 18–20-inch-thick (460–510 mm) basement walls of this limestone. The South Beloit area has a thick deposit of sand, and industries were built here because of its unusually fine quality. A fine quality of clay was also found in the state line area. Many Peoples have inhabited South Beloit over the years, including the Mound Builders, Sioux, and Illinswek (Illinois). The Turtle Indians of the area were the Winnebago Tribe, Siouan family. They had villages all along the Rock River and Turtle Creek. One large village was in modern-day South Beloit and all the way up to northeast Beloit. It was named for an important chief, Kau Rau Maw Nee (Walking Turtle). Turtle later became modern day Beloit and South Beloit. 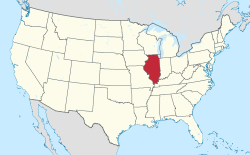 In 1818, Congress told the people of the Territory of Illinois to form a Constitution and adopt a state government. A heated debate arose over the correct placement of the northern state line of Illinois. Most people in the lead region and the northern part of the territory did not want to be part of the state because of a large debt and tax for internal improvements. The northern part was against slavery and wanted a Lake Michigan shoreline. If the old line of 1787 were kept, Illinois would be much smaller than Wisconsin and Chicago would be in Wisconsin because Illinois would have no Lake Michigan shoreline. Getting fed up with everything, Nathaniel Pope, who represented Illinois, went ahead and proposed the bill to congress. His bill proposed cutting 8,500sq. miles off of Wisconsin and adding it to Illinois. Thus the current state line. Illinois had become a state in 1818, Winnebago County was organized in January 1836, and public surveys started in the fall of 1836. Government sale of lands started in 1837-39, but Rockton Township sale was held until 1843 because of claims made by Polish exiles in 1843 for land previously held by early settlers in and around Rockton and Rockford. Their claims were discounted and the land was put up for sale when the land commission declared the Polish Count had not fulfilled the terms of the agreement. He was to have the choice of three adjacent townships and live on the land, making improvements for ten years. The Polish had chosen Townships 44 and 46, Range 1, East, and not 45 and had not settled on the land. The early settlers held the land by squatters’ rights and were now able to buy their farms from the government for $1.25 an acre. This was also the time when Winnebago County tried to secede from Illinois and attach itself to Wisconsin. The people living there disapproved of the $14,000,000 debt for internal improvements with an empty treasury and insufficient revenue. The southern part of the state was poor and unprogressive, in contrast to the industrious north. Winnebago County voted in 1842 for annexation to Wisconsin. 972 voted for it, and only 6 voted against it. However, the south had more people and out-voted the north. So Winnebago County remained in Illinois. By 1838, the village of Turtle had grown large enough to resent the Indian name it had used for so long. They also rejected the suggestion of 'New Albany'. A committee (or possibly two committees) was chosen to propose a new name. The French word for nice or pretty is 'bellotte'. The committee members, remembering a happy time in Detroit, sounded the word for pretty and came up with Balloit, then Beloit. The name was approved, reported to the settlement, and accepted. South Beloit became the south part of Beloit. By the early 1900s, the city was thriving according to the standards if the time. With 1200 people living there, it petitioned other governments to become a city in 1914. The petition was approved, and in May 1917, a special election was held to file for incorporation. The election passed and South Beloit became a city on September 17, 1917. The initial city did not include a certain portion to the West side of the city, which joined the city on May 2, 1921. The police department was established as one of the first departments by ordinance No.13, October 1917. It started off as a one-man, part-time enforcement. The first squad car was purchased from Saris Auto Company in 1923 for $431.71. In October 1928, the Department bought a motorcycle from the Beloit Police for $100. In April 1957, the Department became radio operated by the purchase of a Motorola Police Base Station for $587 and the hiring of Richard Miller as the first radio operator for $316 a month. In February 1927, there was a bond issue to remodel City Hall, which included the establishment of a fire department and purchase of fire equipment. The first group of volunteers met in fall, 1927 and, with the help of Beloit firemen, learned how to use the equipment and effectively fight fires. The fire truck, a W.S. Knott, was manufactured in Minneapolis and delivered in February 1928 by Clare Hillman, who was familiar with its operation and became the first fire chief. The first uniformed department was made up of twelve members, plus Chief Hillman. These early volunteers were Edward Brady, George Graves, George Holtz, Arthur Schultz, David Bliss, James Howard, John Jensen, Thomas Flannigan, Robert Smith, Everett Clussman, Erwin Earl, and Fay Hanson. In 1859 a group of settlers living on the east side of the city purchased a piece of land from Dr. E.N.Clark for $125. The school house, costing $621, was built on that property. The district at the time of the purchase was District No.11, Town of Rockton, Winnebago County, and was called Clark School after Dr. Clark. Another South Beloit school was Butler School, started at least by 1877 and probably around 1859, on the other side of the river. Mrs. Marguerite Warren, a teacher long ago in South Beloit, compiled a list of some of the students that went to the old Butler School. Ed Burger, Charles Burger, Mrs. Castner, Melvin Lynch, Elloit Warren, Magda Guetschow, Martha Guetschow, Marie Guetschow, William Guetschow, Oscar Nordt, Frances Perkins, Oscar Swanson, Elmer Swanson, Bill Stanley, Everett Chapel, and Henry Zempel were the ones she was able to remember. ^ Hayes, Cathryn Clarity (1967). Our Golden History, South Beloit, Illinois: Its History and Legends, 1835-1967. Golden Days Committee. ASIN B0086OHINE. This page was last edited on 20 October 2018, at 16:31 (UTC).